LaClare, E., & Franz, T. (2013). Writing centers: Who are they for? What are they for? Studies in Self-Access Learning Journal, 4(1), 5-16. The focus of this paper is the writing center: its users as well as its function within a given context. Four semesters of data were examined for the purpose of identifying trends in writing center usage and assessing how these have fulfilled the stated objectives of the center at the time it was founded. It was discovered that more than half of all users were either graduate students or members of faculty, suggesting a vital role for the center in assisting emerging and established scholars in bringing their work to publication. The data also revealed that the vast majority of writing center users came in search of assistance with editing, indicating that users regard the service as product-oriented. Shamoon and Burns (2001) present the modern American university as a Fordist institution, a site of production where the next generation of professionals across the range of academic and technical disciplines are, for want of a better word, manufactured. Their purpose is not to portray a deliberately dystopian view of the academy and its work, but rather to reveal how industrial practices such as the maximization of efficiency and the reduction of costs have shaped institutional attitudes toward entities like writing centers and, by extension, writing center labor. To draw on an example commonly raised at writing center conferences, it is often taken for granted that tutors, being well-equipped to remediate an array of writing problems, should have no qualms about doing so without the participation of the original author. Likewise, there is an expectation that tutors perform their services for little or no pay as their contribution to enhancing the status and competitiveness of the larger institution. The situations mentioned above are illustrative of the type of attitudes directors and tutors have noted, discussed, and struggled against for decades. It seems quite natural for those involved in writing centers and their work to campaign against what Shamoon and Burns (2001) refer to as a “market-driven” (p. 72) educational environment, where centers simply perform the functions demanded by the various stakeholders. However, in a climate of declining enrollment and increasing competition, such as that faced by universities in many countries, it makes sense to question whether one can afford to cling to fixed (and often foreign) notions of what a writing center is or ought to be. Even when limiting the focus from writing centers in general to those located within universities in Japan (as we would like to do here), it is still important to acknowledge a large amount of diversity. Existing studies have examined the appropriateness of using an American model of the writing center in Asian contexts (McKinley, 2010), but these have focused mainly on cultural variables and overlooked more fundamental distinctions that are trans-cultural, specifically the differences between public and private institutions, or between institutions that provide liberal arts education and those that specialize in science and engineering. The imperative to add ‘value’ to the institution and make the most of limited resources has constrained writing centers from the early American pioneers to the more recent iterations that have appeared throughout Asia. In light of Shamoon and Burns’ (2001) explanation of writing center operations as being governed by the Fordist principles of the larger institution in which they occur, it is easy to see why this imperative is likely to be greater in a private university, or a university whose choice of academic offerings makes it more at ease with the metaphor of higher education as a form of industrial production. The perception of writing centers as offering a service has been nurtured by tutors and directors alike from the earliest incarnations right up to the present. However, it is a service that has always sought to impose limits and restrictions upon the types of assistance on offer. While in the majority of cases these limitations have a sound rationale, perhaps to maintain the boundary of what constitutes a student’s own work, or to prevent faculty members from dropping off papers to be collected at a later date, others are what Clark and Healy (2008) refer to as “defensive strategies” (p. 245), more reflective of political than instructional concerns. Itemizing these concerns or attempting to address whether or not they are justified is beyond the scope of this paper. Rather, we will explore our own writing center data in an effort to determine whether or not it is desirable or even feasible to place an embargo on certain types of services, those which writing center orthodoxy suggests are off limits. While the proposal also mentions that the center would “adhere to basic tenets of L1/L2 writing center theory and practice” (personal communication, July 12, 2010), the tenets themselves are never made explicit. The vagueness owes more to a concern for those tasked with translating and explaining the proposal than any desire to obfuscate the intentions of the center. Although it may not have been by design, this vagueness has served a valuable function during the past two and a half years as the center has struggled to find its niche. As with many fledgling writing centers, the number of appointments during the first several months was disappointing. The poor response was likely the combination of numerous factors (such as students and faculty not knowing about the center, lack of understanding of the services offered and absence of writing from the curriculum). The unfortunate consequence of this slow start was that the center’s hours of operation were cut back and the tutors assigned to different tasks. Despite an eventual rise in the number of appointments, the original schedule has yet to be restored. It should also be noted that records show a natural ebb and flow in the number of appointments made throughout the year, a phenomenon most likely resulting from the demands of the students’ departmental courses. Underuse is not a problem unique to new centers. Many directors have reported drops in appointments or fluctuations they cannot easily explain to university administrators. The existing literature on writing centers is replete with accounts of various interventions, from scavenger hunts (Durhman, 2003), to referral forms, to orientations (McKinley, 2011). However, in circumstances of scant human resources, there is little incentive to attempt to dramatically increase the number of writing center appointments. The danger of this is that by failing to challenge the status quo, opportunities to expand and enhance our mission may be missed. As the title of this paper suggests, there are two fundamental questions we would like to answer: who are the users of writing centers such as ours (those situated in private science and engineering-focused institutions), and how are they using the center (prewriting, focus, organization, development and support, editing)? In the paragraphs to follow we will tackle the first of these questions by referring to data collected during the 2011/12 and 2012/13 school years. Table 1 shows that of the total number of appointments, 94 were attended by undergraduate students, 46 by graduate students, and 36 by faculty. Though it would appear that undergraduates are making the most use of writing center services, it is worth pointing out that graduate students and faculty often collaborate on research projects. For this reason it may be more illuminating to consider these two groups together. Thus, undergraduates make up roughly half of the appointments (53%) while graduate students and faculty make up the remainder (46%). However, looking at the number of individuals attending appointments from the various groups, a different picture emerges. Table 2 reveals that, while just over half the total appointments were attended by undergraduates, they represent only 35 percent of the total number of individuals attending sessions. Graduates meanwhile represent a third (34%), with the remainder (31%) being members of faculty. A distinguishing feature of writing centers embedded in ESL/EFL contexts is that they extend their services to graduate students and members of faculty, groups presumed to be in little need of such assistance in places where English is the L1. Much has been written about the struggles of emergent scholars faced with the double burden of remaining at the forefront of research in their own fields while trying to elevate the level of their English composition skills (see Ammon, 2000; Belcher, 2007; Canagarajah, 2003; Casanave, 1998; Curry & Lillis, 2004; Flowerdew, 2000). If nothing else, scholarship in the field has established the need for writing centers staffed with professionals who can assist the global community of scholars in bringing their work to an international audience through publication in English. Flowerdew and Li (2009) report that “publication has become a graduation requirement for Master’s and PhD students” (p. 160) in many mainland Chinese universities. Indeed, for those studying science in PhD programs at elite universities, publication must be in an English-medium overseas-based journal. While we are aware of no such requirements at Japanese universities at present, publishing in English is clearly encouraged and regarded as beneficial to both the student and the university as a whole. Meanwhile, there is a growing expectation among supervisors that graduate students prepare presentations in English for international conferences. Another factor that sets ESL/EFL embedded writing centers apart from those situated in English speaking countries is the absence of peer tutors. While nearly all American writing centers rely on what Riley (1994) refers to as the “happy amateurism” (p. 32) of student labor, formalized peer tutoring within the writing center is notably rare elsewhere. The most obvious reason peer tutoring does not take place in our particular context is the shortage of competent writers among the student population. Although there are also cultural factors that complicate peer tutoring, we will not attempt to explore these here. Instead we will focus on the ramifications for a center unable to offer its users support from more skilled peer tutors. Although the situation is gradually changing, it has long been thought by Japanese secondary students that science and engineering universities are ideal places from which to escape the burden of English study. It is a notion that universities themselves have done little to dispel until quite recently. However, despite the clear commitment of many institutions to improve their English language programs, the culture of underachievement in English persists. Many students of science and engineering seem to feel that if they are poor in English, they are at least in good company. The presence of peer tutors might be sufficient to disrupt the cozy apathy that maintains the status quo. Murphey (1998) has written of the importance of a near peer role model, someone whose language skills exceed most others – though by a margin that is more likely to inspire than intimidate. In addition to being more approachable than native English speaking tutors, peer tutors can offer much-needed L1 support and encouragement. Although we are aware of no studies offering empirical evidence that the presence of peer tutors in ESL/EFL contexts increases writing center use among undergraduates, it is not unreasonable to assume they would have such an effect. To conclude, our data reveals that graduate students and faculty account for a large percentage of the total writing center appointments (46%) and an even larger percentage of the total number of users (65%). This surely distinguishes our center not only from those which operate in English-speaking countries but also from those located in the liberal arts faculties of international universities in Japan, such as Sophia University (see McKinley, 2011). Undergraduates comprise just 35 percent of the total number of writing center users. Scholars of second language writing in Japan have identified a number of conditions that might assist us in explaining this: de-emphasis of writing in the secondary EFL curriculum (Reichelt, 2009), lack of recognition of EFL writing as important (Reichelt, 2009), or lack of authentic purposes for EFL writing (Hirose, 2001). The absence of peer tutors is another likely explanation for the low percentage of undergraduate users. As with most writing centers, regardless of context, the foundation of our service is the one-on-one tutorial session. Although some highly innovative centers offer a workshop-only program, ours has made no such attempts to break with orthodoxy. In addition to limited human resources (at present just three tutors are responsible for handling all writing center appointments), the types of services sought by our users do not lend themselves to such innovative approaches. In our tutorial log, tutors were asked to indicate the main focus of a session by choosing options from a drop-down menu. Table 3 shows these options and how the writing center appointments of 2011/12 and 2012/13 were distributed across them. A great preponderance of tutorial sessions (nearly 84%) were dedicated to assisting users with issues related to editing. The reasons for this are varied and will be explored in detail in the paragraphs to follow, but let us start with a couple of general observations. As mentioned previously, a large number of the center’s users are graduates and faculty, nearly all of whom arrive with text-in-hand. Indeed, only a small number of appointments (less than 2%) were attended by users without a prewritten text of some description. Of all the appointments during the period in question, no more than a few involved tutoring that extended beyond the issues raised by the text itself. If we may return for a moment to the “market-driven” nature of writing center work, it is easy to see where demand lies in a science and engineering institution such as ours. Considering the data presented in Table 3, it is hard to imagine that our writing center would survive an outright prohibition on editing. McKinley (2011) reports that students visiting his writing center “expected tutors…to read their papers and correct their grammar” (p. 293). This he cites as an example of the “misconceptions of the writing center service” (McKinley, 2011, p. 294). However, in circumstances where the vast majority of users are coming in search of a particular service, is it desirable or even feasible to deny it? Clearly the writing center service is highly context-dependent, and it should be pointed out that the center McKinley describes is located within a liberal arts faculty whose students are required to complete their academic work in English. The high value undergraduate users place on grammar correction likely stems from previous EFL writing experiences. Translation tasks are common in the secondary classroom, but these rarely go beyond the sentence level (Hirose, 2001). Thus, the emphasis remains on accuracy, with little attention given to broader structural issues. For example, according to Dyer and Friederich (2002), Japanese secondary students are unaware of the concept of process writing. In the case of members of faculty, most making appointments with writing center tutors do so for the purpose of fine-tuning scholarly articles in preparation for publication. Nearly all express an eagerness that their papers be rendered error-free. While this preoccupation may have its origins in EFL writing practices that date back to secondary school, it is more than justified by the rigorous standards of academic publishing. Perhaps it is worthwhile to turn our attention for a moment from the services users want to those they seem not to want. Referring once again to Table 3, one can see that few come in search of assistance with what most Western-trained tutors would identify as the basic steps of the writing process. This is not surprising when one considers that undergraduate users are unlikely to have had any exposure to the rhetorical frameworks of English language writing (Heffernan, as cited in Reichelt, 2009). On the other hand, faculty and most graduate students arrive with what Shamoon and Burns (2001) describe as “an operative familiarity with the steps in the writing process” (p. 66). Considering the experience of these writers and the nature of their texts, the categories shown in Table 3 are mostly irrelevant. In addition to indicating the main focus of the session, writing tutors were also asked to record the specific task requested by the user. 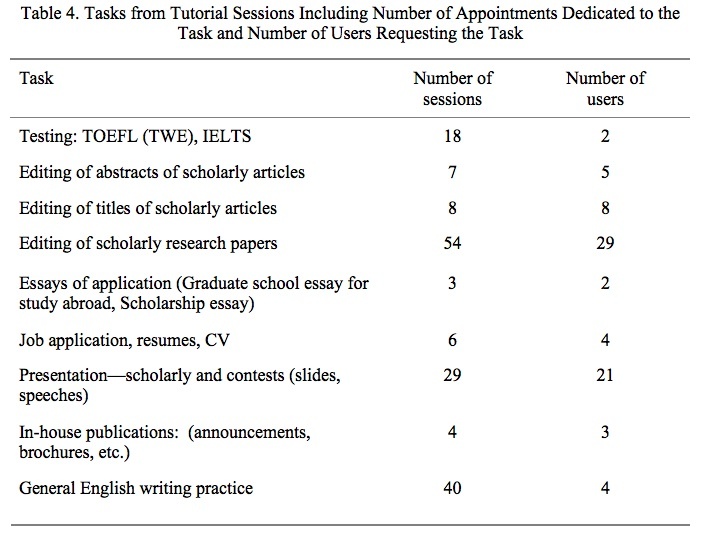 These are listed in Table 4, with a distinction made between the number of sessions dedicated to the task and the number of users requesting the task. This distinction was made because, while at first glance it may appear that “Testing” was of significant concern to writing center users, in fact it was of significant concern for only two users. Also, it should be noted that three tasks – “Editing of abstracts,” “Editing of titles,” and “Editing of scholarly research papers” – may be combined as these tasks were all in service of one goal: scholarly research paper publication. When combined, these items make up the bulk of tutorial tasks. One of the strongest rationales for foregoing the one-on-one tutorial in favor of workshops is that it increases efficiency by reducing duplication of tasks or work. However, in situations such as ours where the work is non-standardized, the opposite effect is observed. Indeed, attempting to create workshops or other learning opportunities in the absence of either supply (tutors) or demand (users) is without practical or ideological justification. However, we acknowledge that the situation is unlikely to remain exactly as it is now, and that we should prepare for new eventualities. As writing begins to take a more prominent place in the undergraduate curriculum, demands on the center and its services will no doubt change. Perhaps these new demands will best be met by offering workshops, perhaps not. Only time will tell. In our own context, we expect that graduate students and faculty will remain the primary consumers of writing center services. It is also clear that for the foreseeable future at least, editing work will remain the cornerstone of what we do. Although some in the field of writing center theory may view this as a form of exploitation, we prefer to regard it as “a coming together of means and circumstances that serve the productivity of both the university and the center” (Shamoon & Burns, 2001, p. 65). As English continues to gain traction as the lingua franca of academic discourse, it is likely that we will witness the appearance of more and more writing centers throughout the non-English speaking world. It is not hard to imagine that ESL/EFL embedded writing centers will eventually outnumber those situated in English language contexts. Perhaps they already do. As such, it is time to take a fresh look at writing centers and the work they do. Who are they for? What are they for? If nothing else, it is time to recognize the diversity that exists and initiate an open and frank exchange of ideas that will assist in shaping the future course of writing center labor. The resulting discussions will inevitably offer up differing and contradictory visions of our mission and service, but the process of redefinition can hardly take place otherwise. Elton LaClare is a lecturer at the Sojo International Learning Center at Sojo University in Kumamoto, Japan. His research interests include learner autonomy, second language writing, reading fluency, and CALL. Tracy Franz also serves as a lecturer in Sojo University’s International Learning Center in Kumamoto, Japan. In addition to writing center work, her professional interests include L2 composition and developmental writing. Ammon, U. (2000). Toward more fairness in international English: Linguistic rights of non-native speakers? In R. Phillipson (Ed. ), Rights to language: Equity, power and education (pp. 111-116). Mahwah, NJ: Lawrence Erlbaum. Canagarajah, A. S. (2003). A somewhat legitimate and very peripheral participation. In C. P. Casanave & S. Vandrick (Eds. ), Writing for scholarly publication: Behind the scenes in language education (pp. 197-210). Mahwah, NJ: Lawrence Erlbaum. Clark, I. L., & Healy, D. (2008). Are writing centers ethical? In R. Barnett & J. Blumner (Eds. ), The Longman guide to writing center theory and practice (pp. 242-259). New York, NY: Pearson Longman. Durhman, L. (2003). Greatly improving writing center attendance. The Writing Lab Newsletter, 27(10), 6-7. Flowerdew, J., & Li, Y. (2009). The globalization of scholarship: Studying Chinese scholars writing for international publication. In R. Manchón (Ed. ), Writing in foreign language contexts: Learning, teaching, and research (pp. 156-182). Tonawanda, NY: Multilingual Matters. Hirose, K. (2001). Realizing a giant first step toward improved English writing: A case in a Japanese university. In I. Leki (Ed. ), Academic writing programs (pp. 35-46). Alexandria, VA: TESOL. Reichelt, M. (2009). A critical evaluation of writing teaching programmes in different foreign language settings. In R. Manchón (Ed. ), Writing in foreign language contexts: Learning, teaching, and research (pp. 156-182). Tonawanda, NY: Multilingual Matters. Riley, T. (1994). The unpromising future of writing centers. The Writing Center Journal, 15(1), 20-34. Shamoon, L. K., & Burns, D. H. (2001). Labor pains: A political analysis of writing center tutoring. In J. Nelson & K. Evertz (Eds. ), The politics of writing centers (pp. 62-73). Portsmouth, NH: Boynton/Cook.